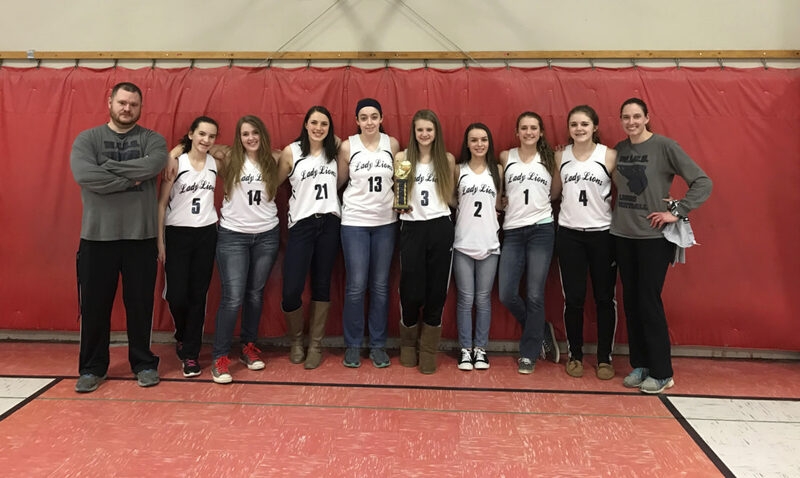 The Warren County Christian School Lady Lions took first at the Winter Thunder Invitational this weekend in Meadville. Pictured from left to right are coach Robert Marrone, Lilly Sabella, Lindsey Carpenter, Kiara Baker, Desirae Kerr, Allie Marino, Grace Sabella, Emma Marino, Rachel Brenner, and coach Monica Kerr. 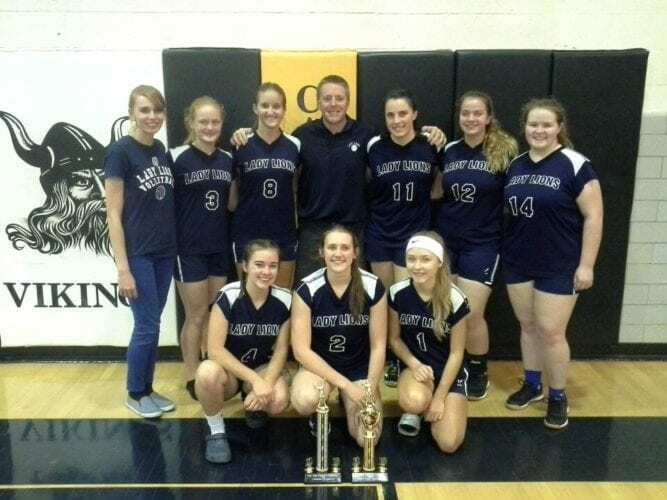 MEADVILLE — After winning the New Penn Christian Conference Tournament in Erie last weekend, the WCCS Lady Lions hit the road again to pick up a pair of wins at the Winter Thunder Invitational hosted by Calvary Baptist Academy. The Lady Lions opened the Invitational with a 34-21 win over Evangel (Va.), using their full-court press to set the tone with a 10-2 run in the first quarter. Rachel Brenner led all scorers with 15 points while Emma Marino added nine points and Desirae Kerr had a strong all-around game with four points, four assists and six rebounds. 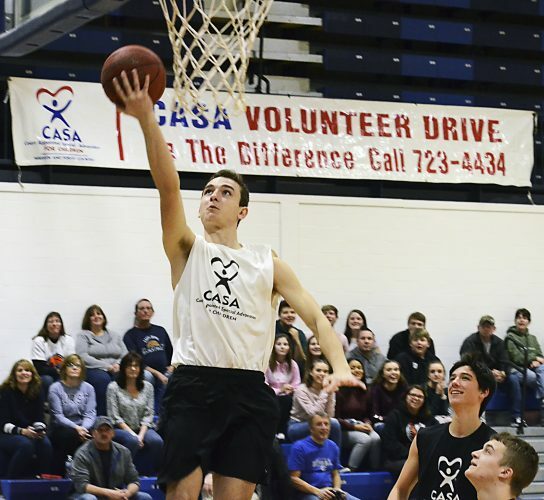 Warren County Christian also had contributions from newcomers Grace Sabella and Lindsey Carpenter, while Kiara Baker helped the rebounding game with six boards. The win over Evangel moved the Lady Lions into the championship game, where they edged out Plants & Pillars by a final score of 26-24. Again, WCCS set the tempo early with a 9-3 run in the first quarter and avoided foul trouble as the game became increasingly physical. Baker led the way with eight points to go along with six rebounds while Marino was close behind with seven points, five rebounds and four assists. Kerr grabbed a team-high 11 rebounds and also added five points and Brenner chipped in 10 rebounds and five points. Plants & Pillars converted just 5-of-22 shots from the foul line and WCCS won the rebounding battle 34-28. 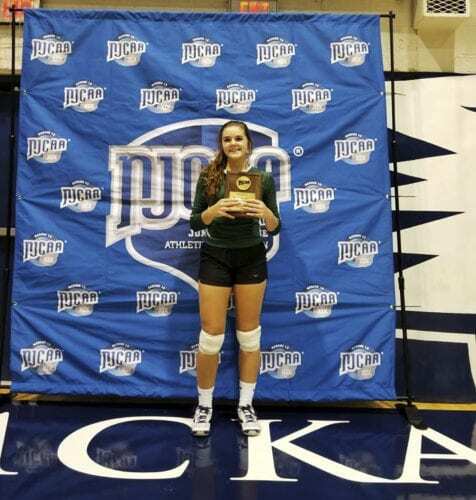 For their efforts over the weekend, Brenner and Baker were selected to the All-Tournament Team. Brenner averaged 10 points per game and totaled 15 rebounds while Baker averaged five points per game with 12 boards. The Lady Lions finish the season with an overall record of 12-2. Evangel (21): Haralson 0-1-6-1, Sirak 2-0-0-4, Simms 1-2-4-4, Pedersen 1-0-0-2, McNeil 4-2-11-10. Totals 6-5-21-21. WCCS (34): E. Marino 4-0-0-9, Kerr 2-0-0-4, Brenner 7-1-2-15, Baker 1-0-0-2, G. Sabella 1-0-0-2, L. Carpenter 1-0-0-2. Total 16-1-2-34. 3 Pointers: E. Marino (W) 1. Plants & Pillars (24): Hartman 4-4-11-15, Bartley 3-1-2-7, Deroza 1-0-0-2. Total 8-5-22-24. WCCS (26): E. Marino 1-5-12-7, Kerr 2-1-2-5, Brenner 2-1-2-5, Baker 4-0-0-8, A. Marino 0-1-2-1. Total 9-8-18-26. 3 Pointers: Hartman (P) 3.